Italian language courses are taught by Mario Fusco and Angelica di Chiara Fusco. Both Mario and Angelica were born and educated in Italy, and, as California residents, they continue to share their knowledge and love of their native country with anyone who is interested in learning and appreciating the various aspects of Italian lifestyle. Their organization, the Italian Educational Institute, housed on the campus of Menlo College in Atherton, is the venue through which language and culture classes are offered and Italian events are organized. We hope you enjoy what you see here and hope to see you in one of our classes or events. Arrivederci. The city of San Francisco is the fortunate home of the Leonardo da Vinci Society. This Society is a beacon of Italian culture and history, having operated in the City since 1951. Launched by Countess Lillian Dandini, Mrs. Dobbins D’Anneo and Mrs. Louis Piccirillo, the Society provides today a venue for speakers on a wide variety of Italian topics, ranging from art to history, music and politics, travel and lifestyle. Most of the Society’s event are held at the Museo Italo Americano at Fort Mason Center. A sampling of past and future lectures includes: “Venice as a Work of Art”, by Terisio Pignatti, Chair of Italian Culture at USB; “Dramatic Readings of the Divine Comedy”, by A. F. Alberico, Dept. of Italian at SFU; “Pirandello’s View of Man”, by Giovanni Cecchetti, Dept. of Italian at Stanford University, “Fibonacci and his Mathematics”, by Keith Devlin, Executive Director of the H-Star Institute at Stanford University. Coming up in September, the Society will host author Carol Field, presenting her newest book, “The Italian Baker – revised”. Each presentation lasts about 50 minutes, and is followed by a question/answer period and a brief reception during which the members can mingle and interact further with the speaker. Unlawful to die in Italy! Falciano del Massico is a town of about 4000 souls near Caserta, in the south of Italy. In this town it is forbidden, by municipal edict, to die. The edict was promulgated by the Mayor of Falciano del Massico to try to remedy a situation which has been festering for almost half a century, ever since Falciano del Massico was separated from the neighbouring town of Carinola and incorporated as an independent city. In the process the existing cemetery was left entirely within the boundaries of Carinola, leaving Falciano cemeteryless. 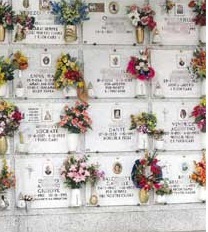 Not for the Mayor of Falciano to find a mundane solution such as contracting with Carinola to bury Falciano’s dead in Carinola’s cemetery, or of building a new cemetery for Falciano. Better not to allow anyone to die: more humane, more cost effective, and ecologically sounder. No penalty is specified for contravening the anti-death city ordinance, and it is known that at least two elderly residents of Falciano have shamelessly contravened it already. The most important musical exhibition in Italy is the San Remo Music Festival, known to Italians simply as “il festival”. This is a yearly event in which previously unreleased songs compete. It was launched in the pre-television days of 1951, and has been held without interruptions since that time. Today, of course, it is a major event on RAI1. San Remo is a little town on the Italian Riviera (Riviera di Ponente), not far from the French border. It is renowned for its flower industry and is a sought-after tourist destination. Notable people from Alfred Nobel to Italo Calvino to well-known members of European nobility have vacationed in San Remo. Everything Italian on one site! 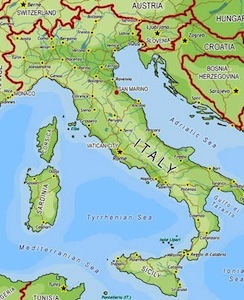 Looking for Italian language instruction? Organizing a trip to Italy? What about finding the greatest Italian restaurant in the Bay Area or that ultimate recipe just like your grandma used to make? Or perhaps you spent too much time watching the game (alas!) with your buddies, and need a little Italian bauble to soothe your lovely wife’s ruffled feathers. All of these things you will find on our website. We have consolidated the contents of a couple of earlier sites to provide you with a seamless Italian experience. Along with the new commercial elements there remains, on this site, the original focus on art, culture, and history. And we intend to grow: the ultimate aim is to provide all Italophiles of the Bay Area, and beyond, a one-stop electronic storefront that will provide intellectual stimulation alongside material possessions for gracious living. 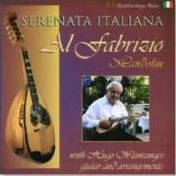 Our sister site, finestItalian.com, continues unchanged, though it, too, is slated for some enhancements. So please come visit often, drop us a line, let us know how you feel. Buy some Italian art once in a while, or an Italian pendant for your sweetheart, or a gorgeous ceramics bowl for your holiday table. But even if you don’t, we hope to hear from you. The prizewinner was the casata, a dish from Latium, which is a kind of pie based on an ancient recipe and made of two different dough mixes which should layer and not intermix, a result that can be verified only when the pie is cooked and eventually cut. As agriturismo continues to grow in Italy we can look forward to more such contests and sagre that will showcase the local culinary specialties connected to each agriturismo. All good for the vacationing public, which stands to benefit from the increased competition and the resulting improvement in the quality of agriturismo fare. If your intent is to relax and unwind, an agriturismo vacation is hard to beat: the Italian countryside, magically timeless, the Mediterranean climate and its glorious vegetation, excursions to solemn pinete as spiritual as any church, the rediscovery of ancient unhurried rhythms and practices, top-notch food, group activities in a convivial setting ideal for bonding with your family and making new friends … what more could you ask? In 1889, during a visit in Naples, Queen Margherita of Savoy was served a pizza resembling the colors of the Italian flag, red (tomato), white (mozzarella) and green (basil). 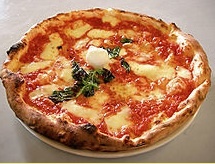 This kind of pizza has been named after the Queen as Pizza Margherita.